Do you love trucks? If so, you should check out some of the truck simulator games for Windows 10 in which players ride trucks through 3D landscapes. Even if you don’t have a love affair with trucks, these simulators can still be a lot of fun as they showcase some of the USA’s most dramatic landscapes in glorious 3D. SCS’s American Truck Simulator is one of the latest and best truck simulator games for Windows with game mechanics based on Euro Truck Simulator 2. 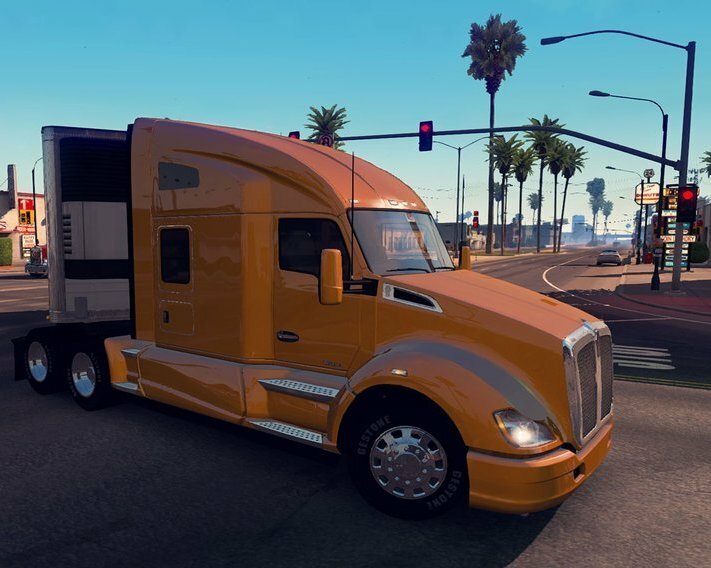 While Euro Truck Simulator 2 was a European trucking affair, American Truck Simulator takes players to the USA and includes the western states of California, Arizona and Nevada. American Truck Simulator currently retails at $19.99, and this game is compatible with Windows, Mac OS X 10.9 and Ubuntu (Linux). Players can select from a range of trucks among which are the Kenworth T680, Kenworth W900, Peterbilt 389 and Peterbilt 579. The game incorporates a business simulator that puts you in the seat of a trucker on the local freight market who delivers goods within a specified time frame. Players can also run their own trucking business with owned properties, which adds more variety to the gameplay. Rig ‘n’ Roll is the sequel to Hard Truck 2: King of the Road, so it’s effectively another installment to the Hard Truck series. This is a story-based truck simulator set in California that recreates many of California’s cities in glorious 3D. Although primarily a truck simulator, it also includes race events. This game retails for $9.99 on Amazon, and you’ll need a hefty 10 GB of storage space for it. Aside from that, its system requirements are fairly lightweight. Rig ‘n’ Roll is about California’s highways, and the simulator includes all the state’s major freeways. 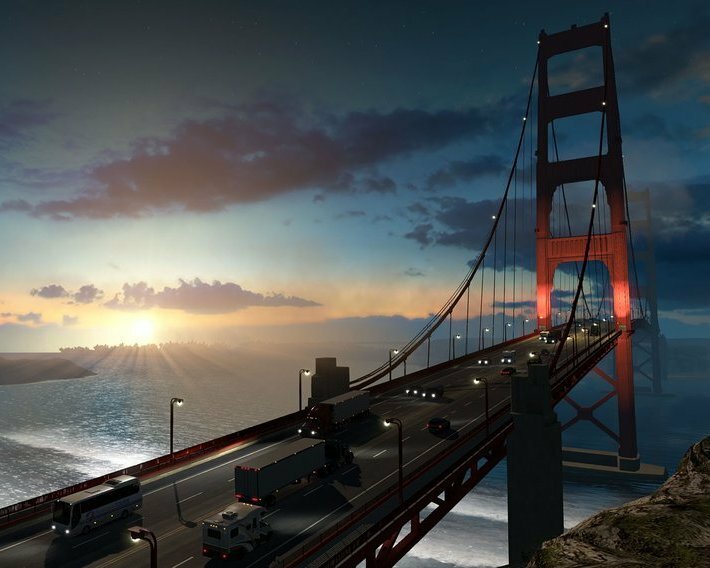 Furthermore, the game has 40 Californian cities, among which are San Francisco, Los Angeles and San Diego. The game’s story is based on Nick Armstrong who establishes his own trucking company in California, making Rig ‘n’ Roll gameplay all about outrunning rival companies to deliver cargo on time and even going head-to-head in more direct truck races. 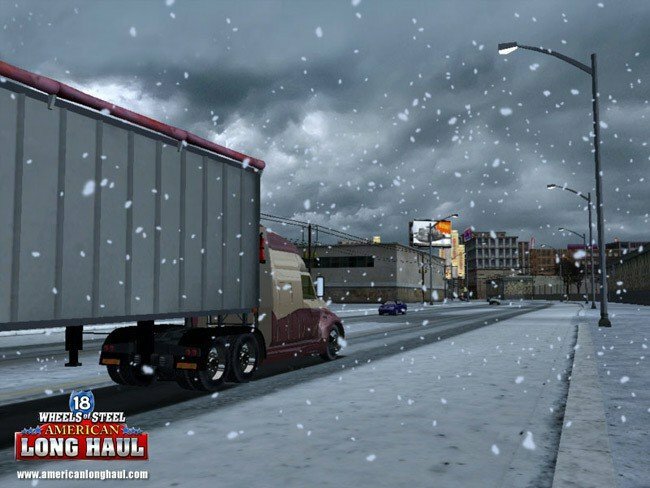 In this way, Rig ‘n’ Roll could be considered a racing game that also offers players the chance to explore expansive environments with authentic Sterling, Kenworth, Peterbilt and Western Star truck models. You also get to run your own cargo transport company like in American Truck Simulator. Overall, Rig ‘n’ Roll effectively combines the simulator and racing game genres for a high-thrill truck romp across California. Wheels of Steel is an SCS and ValuSoft truck simulator series that has had eight installments. One of those is American Long Haul, which isn’t the most recent Wheels of Steel game. However, this truck simulator has a fairly extensive roster of North American cities in the USA, Canada and Mexico with most of the more notable interstate highways included. American Long Haul is available for Windows, and the digital version retails for $9.99. In American Long Haul, players can drive through 45 North American cities, mountain ranges, barren deserts and the Great Plains. Los Angeles, Dallas, Las Vegas and San Franciso are just a few of the more notable U.S. cities in the game. Having launched in 2007, this might be a slightly outdated truck simulator; but it still has pretty decent graphics with an impressive amount of detail and plenty of varied buildings and skyscrapers. The simulator also has some decent heavy snow, lighting and rain weather effects. 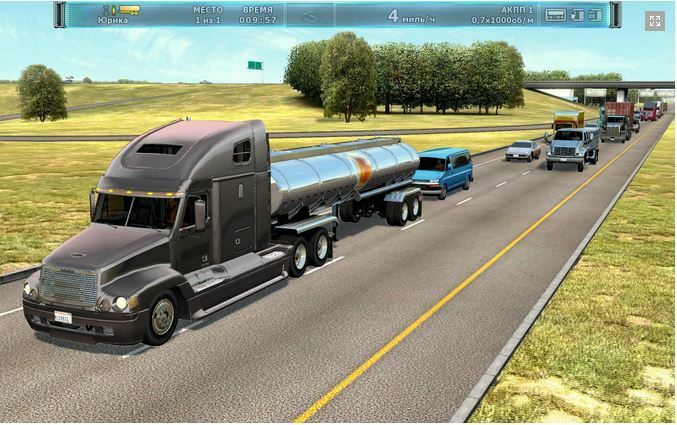 The primary basis of the simulator’s gameplay is to run and expand a trucking business. Players get to ride up to 37 trucks and trailers with which to haul more than 45 types of cargo, but the management aspect of the game is little more extensive than merely delivering goods as you can also negotiate contracts and invest in new trucks and trailers. Extreme Trucker 2 is another game in the Wheels of Steel franchise, and it’s the most recent addition to the series. The original Extreme Trucker game did not include any U.S. states. However, the sequel includes additional Montana and Bangladesh regions to ride through. So the Montana map adds a touch of America to the simulator. Extreme Trucker 2 currently retails for $9.99 on the publisher’s site. Extreme Trucker 2 is not your typical truck simulator packed with major highways. Instead, you must drive across more extreme road conditions through scorching deserts, towering mountain ranges and rainforests. Montana, Australia, Northern Territories and Bolivia are some of the locations in the game. The trucks also carry much more extreme loads. 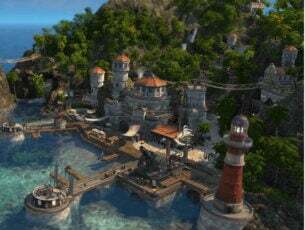 The game gives players up to 35 alternative trucks to transport more than 70 types of cargo. 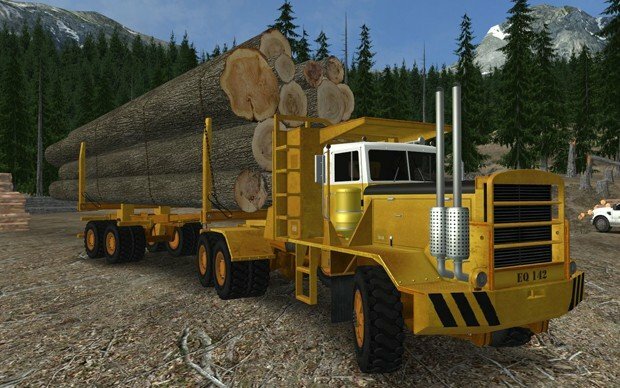 This truck simulator probably offers players a little less in the way of American landscapes and cities than some of the others here, but the diverse terrains and road conditions make it a little more interesting. Extreme Roads USA is another truck simulator with more extreme road conditions. The game has an extensive U.S. map and diverse terrain for players to ride across. The simulator retails for £6.99 (about $8.62) on Steam, and you can play it on both the Windows and Mac platforms. Players can select from 10 trucks and trailers that each have extensive and unique designs. You can further customize those trucks with your own logo pictures for the door and window plates. In addition, you can configure the in-game trucks’ radios with your custom playlists. With their trucks, players must deliver all manner of cargo to various U.S. destinations across tricky routes. Extreme Roads USA also has bold physics and dynamic weather conditions that add a little extra gloss to the game. Get a real taste of the open road with these American truck simulators. Of those, American Truck Simulator is probably the most extensive U.S. truck simulator as it includes three states, and with further planned updates it will only get bigger. When they’ve finished expanding that game, it might include most U.S. states.